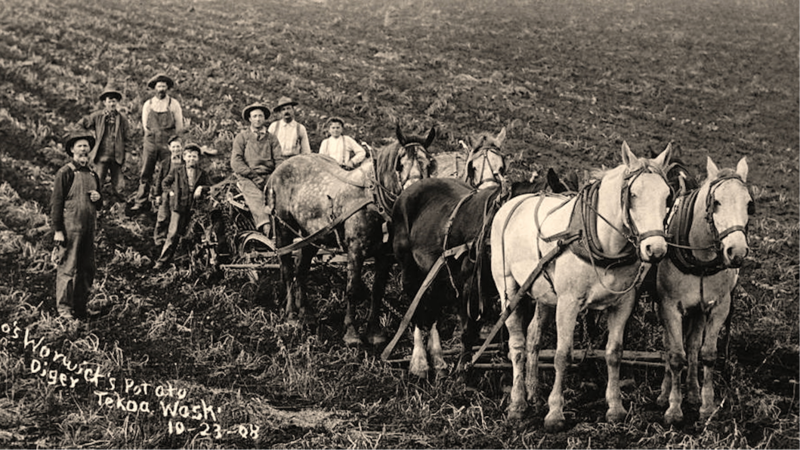 Widespread potato production in Washington State is a relatively recent phenomenon. 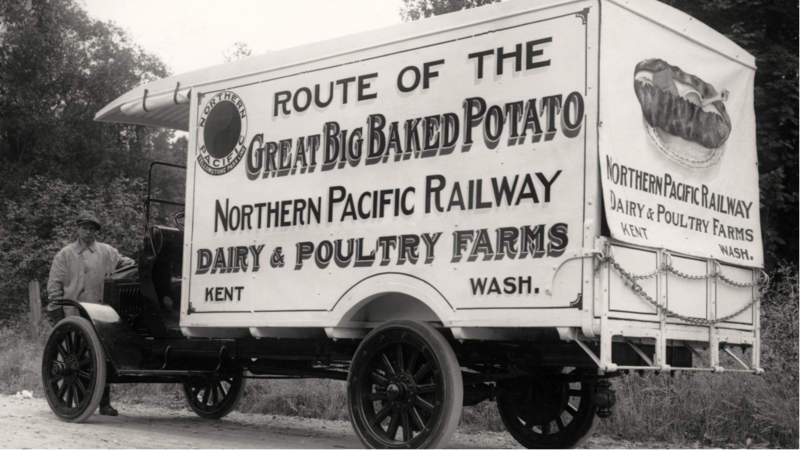 Currently potatoes in Washington are grown primarily in eastern Washington and the Skagit Valley. The climatic conditions, rich volcanic soil, availability of water and long growing season result in Washington State producing the world’s highest potato yield per acre. Though the number of commercial growers number approximately 300, together they plant more than 160,000 acres annually, harvesting averages of 30 tons per acre, twice as much as the average yield in the United States. Washington State produces 20 percent of all U.S. potatoes. 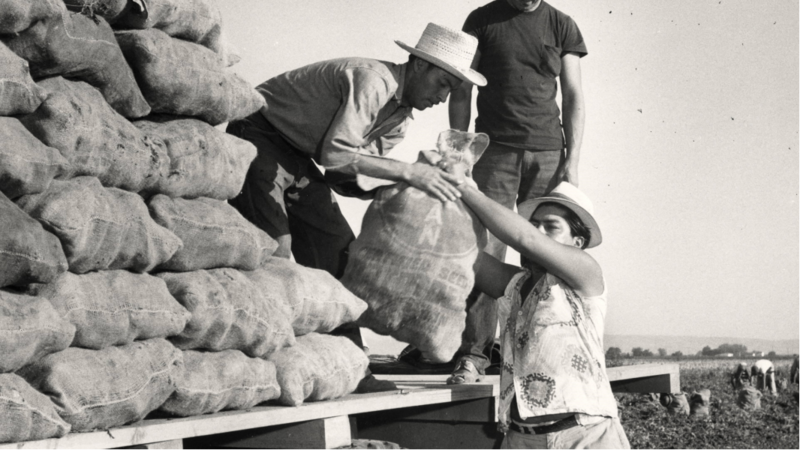 In eastern Washington lack of sufficient rainfall and irrigation was resolved with the development of the one million acre Columbia Basin Irrigation Project. The Project’s main goals were to provide cheap and dependable hydroelectric power and a constant supply of irrigation water to growers. 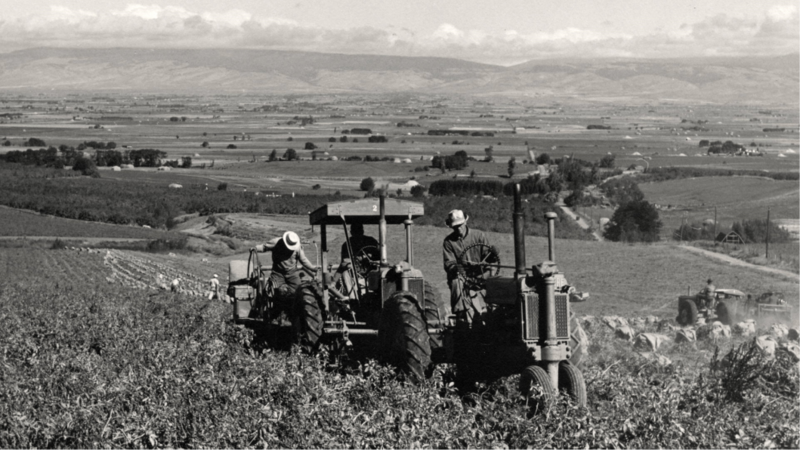 Though the Grand Coulee Dam on the Columbia River was completed in 1941, irrigators had to wait until 1949 and 1950 for enough water to irrigate their fields. Outside the Project, individual growers have developed another one-half million acres of well-irrigated land. In the Skagit Valley growing region between Seattle and the Canadian border, the mild marine climate and rich soil create perfect conditions for red, white and yes… blue potatoes. In 1982, to better address the geographic aspects of shipping from a far western location, Washington packers formed an association to negotiate more favorable freight rates with carriers. Better rail rates were also gained. 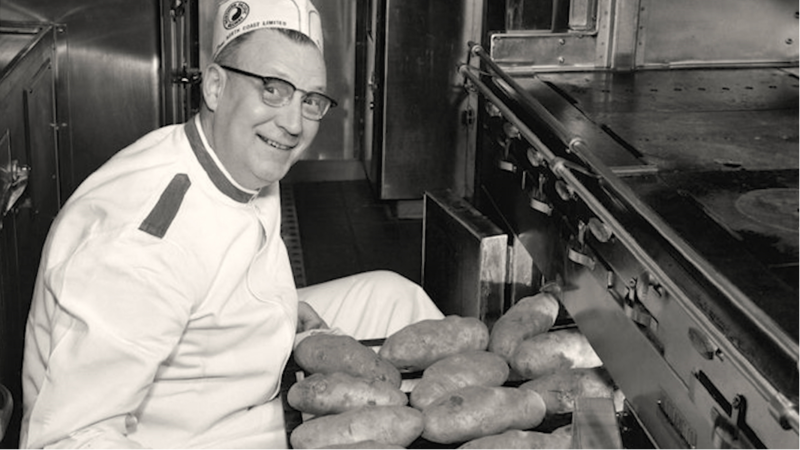 Today, Washington potatoes are shipped to all parts of the United States and exported to the world marketplace. 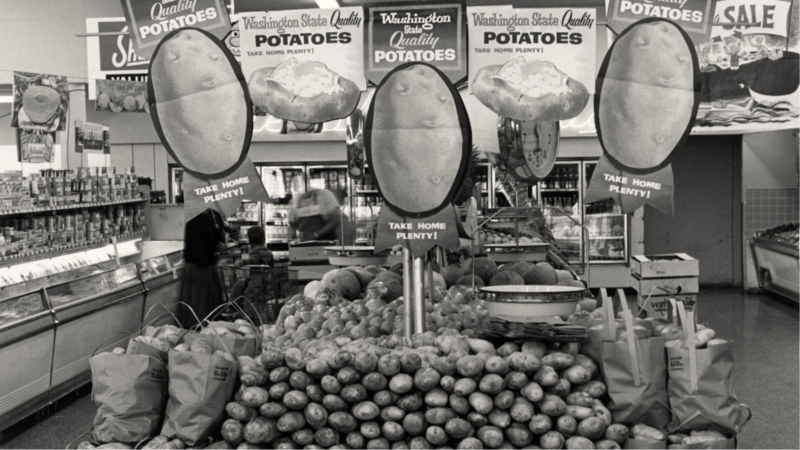 At least nine out of every ten Washington potatoes are marketed outside of Washington State, with a significant portion of these going to overseas markets. Japan purchases approximately 65 percent of the french fries made from Washington potatoes that are exported each year. The Washington State Potato Commission finances one of the largest, most comprehensive, potato research programs in the United States. Scientific research is done in conjunction with universities, the USDA, and private contractors. Currently, the WSPC invests more than $500,000 annually in research projects and advocates for additional millions in federal and state legislative funding. Washington State potato growers take pride in the high standards they have set for growing the perfect potato. They know they are stewards of precious resources. The Washington State Potato Commission is proud to say that Washington potato growers have been recognized with national awards for environmentally friendly and efficient use of water and fertilizers. These growers are among the nation’s leaders in adopting sustainable crop management and new production techniques.